Not sure how to get started? We can help! Getting started is easy, we just require a couple things from you. You can either come into the shop and talk with our staff as you fill out the form or if you want to save time you can print off the Registration Form at home and bring it with you when you come in. The swim rules are very important to avoid confusion between swimmers, staff and swim teachers. Part of the registration is that you have to have read them. If you have any questions or concerns about the rules, please talk with us about them. You can print the Swim Rules for yourself as well. Payment will be due on the first of every month, with the first month being prorated. Amount will depend on the type of package you decide on. 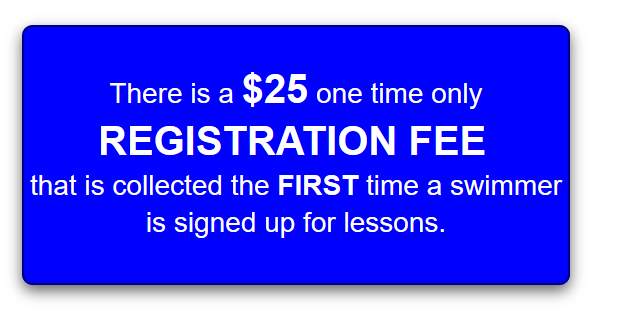 The more months you get, the higher the discount per lesson and the more options available to pay for them. All of our lessons work on the basis of time slots. You reserve your time slot and keep it until you discontinue your lessons. Your Registration Form and Payment must all be turned in before we can choose what time slot works best with your schedule. Lessons start the week after you sign up, NO EXCEPTIONS. We cannot hold your desired time slot for weeks on end until you decide to start.